It’s a wonderful concept; this notion that if we all band together we’ll be stronger than any of us alone. And it’s been proven, too. The Freedom Art folks are a perfect example of the power of a bunch of people networking and sharing together to make more happen than any of us could have made happen if we were alone. 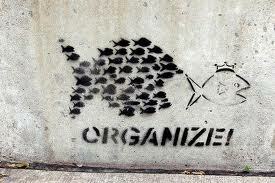 But the thing the image doesn’t tell you is that the act of organizing can be infuriatingly hard. Sometimes I feel like three phone calls and twenty five emails later I’m still at square one on a project. It’ll take weeks to pick a date and by then we’ll have missed half the dates we proposed. We G-chat, G-mail, Google Doc, share calendars, Skype, Face Time, Facebook, Doodle, Toodledo, and write it down and still someone won’t show up that we were counting on, and someone else won’t have made the list they said they were going to make, and no one will leave any further along than when they came. We’ve made all these systems for being faster and more efficient, enabling us to take on more projects than ever, and yet none of the projects get done. I’m heading upstairs in a few hours to work on a few puppet construction things by myself, because at the end of the day I can’t organize anything else. Which begs the question, have we actually become any more efficient? « Taking off with 3BB!